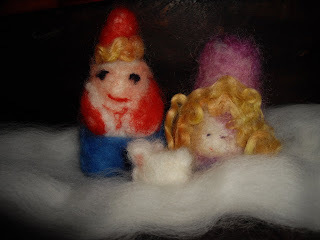 I love the verstility of wool. The possiilities are endless, limited only by our creation. Here are some beautiful creatures my girlfriend's partner brought in for the store. They are for inspirational purposes. 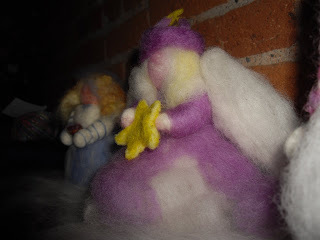 And here is the work of her two crafty kids! A lady come in today and bought my fall wool that I hand spun, it was very inspirational and encouraging so I am continuing spin unique novelty yarns. Today, I spun up some icicle batting that I made last week and wrapped portin of it in flannel camoflage material that I have. 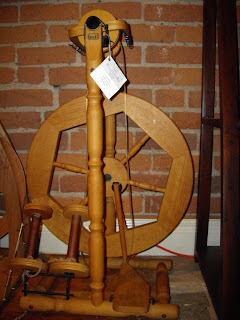 And here is the Louet single treadle wheel that I wrote about yesterday, very nice! It is tempting to bring it home to our place! 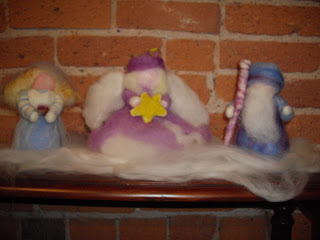 I'm glad you got a photo of your fall wool before it sold - having seen it in person I was captivated by it (felted leaves part of it, for goodness sake!) and now look forward to seeing the icicle batting/camoflage flannel. Wow, Stephanie, what next! !